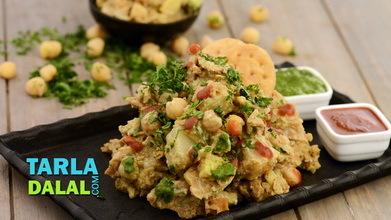 A lip-smacking chaat that is loved all over India, and now globally too, the Chole Tikki Chaat is most enjoyed at roadside stalls, but is definitely more satisfying when you make it at home for your family or for a party. 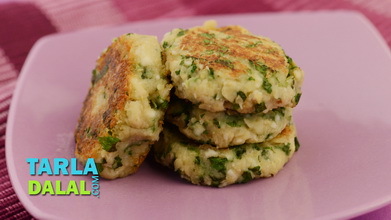 Here, we show you how to make the potato and peas tikkis flavourfully perked up with nigella seeds, and the chole too. 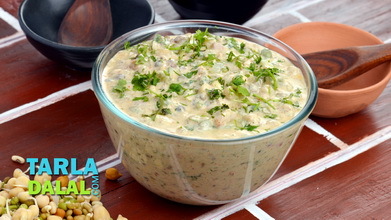 Also pay special attention to arranging this preparation, with curd, chutneys and fresh, crispy sev! 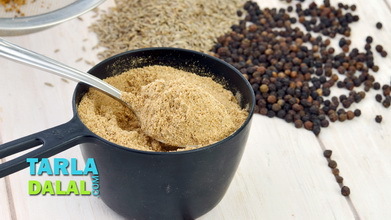 Add the coriander-cumin seeds powder, chilli powder, dried mango powder, garam masala and ½ cup of water, mix well and cook on a medium flame for 1 minute, while stirring occasionally. 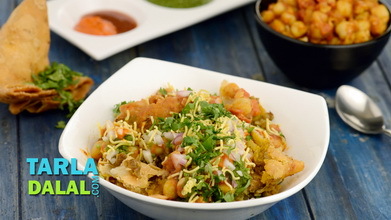 Add the tomato ketchup, kabuli chana, salt and pepper, mix well and cook on a medium flame for 2 to 3 minutes, while lightly mashing it with a potato masher once in between. Keep aside. Heat the oil in a broad non-stick pan and add the cumin seeds and nigella seeds. When the seeds crackle, add the green chillies and sauté on a medium flame for a few seconds. Transfer the tempering into a deep bowl, add all the remaining ingredients and mix well. 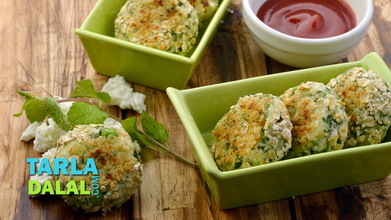 Divide the mixture into 8 equal portions and roll each portion into a 50 mm. 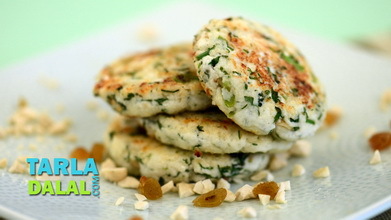 (2”) diameter round flat tikki. Heat a non-stick tava (griddle), grease it with a little oil, place the tikkis on it and cook on a medium flame, using a little oil till they turn golden brown in colour from both the sides. Keep aside. Just before serving, reheat the chole and divide it into 4 equal portions. Keep aside. 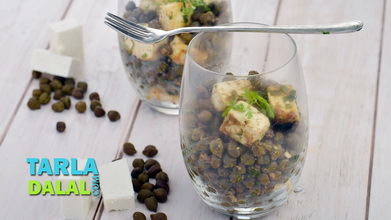 Place 2 tikkis on a serving plate and spread 1 portion of the chole evenly over it. 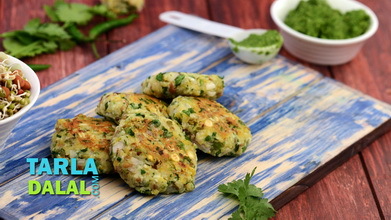 Spread 2 tbsp curds, 1½ tsp green chutney and 1 tbsp sweet chutney evenly over it. Finally sprinkle 2 tsp of sev evenly over it. Repeat steps 2 to 4 to make 3 more plates.